The Suja Juice Cleanse is an excellent cleanse for beginners or veterans who are looking to detox and lose weight. 6 Delicious flavours of juice and a lemon & cayenne water will see you through plus the Suja Cleanse allows for a hearty breakfast of overnight oats that helps you start off the day right and with some normality. Then you have 7 bottles to drink throughout the day so you’re never left long before you’re able to top yourself up again. Now, let’s take a look at what these cold-pressed juices have to offer. Suja Juice send you 21 bottles of juice that you can have over 3 days. You get 6 flavours and this includes 1 detox water and 1 protein drink to help keep your energy up all day long. What’s different about the Suja juice cleanse compared to others is their front-loaded approach to calories. So included is a recipe for overnight oats that you prepare the night before and have for breakfast the next day. I love this. I don’t function as a human being without my breakfast so this is a really important addition to me. And with your overnight oats prepared and eaten you just drink a bottle of juice every couple of hours throughout the day and repeat over 3 days. It’s easy! 3 days is a good length of time because it gives you long enough to really see and feel a difference in yourself without it getting too difficult. Reset Your Cravings – A Suja Juice cleanse will help you reset your cravings so that you’re not always reaching for cookies and sodas all day. It helps you get a clean start and helps your body learn that you can feel great from totally clean foods that are free from preservatives and man-made ingredients. Lose A Little Weight – Not a huge amount, it’s only 3 days after all, but you’ll lose water weight first which will have you feeling lighter but once you start on whole food again you’ll put that back on. But you can still lose 1-3 lbs of real weight over the 3 days which is really good going for such a short time. Get Rid Of Bloating – If you normally eat a lot of processed food you might spend a lot of your time very bloated and be completely unaware, after 3 days your stomach will have had time to rest and fully digest everything it’d been stuck on allowing your gut to calm down and bloating to go away. The point of all of this is to help kick start a healthy lifestyle that allows you to be in control of the food you eat and start living the life you want to live. Not the life that’s governed by cravings for unhealthy food. The real question, how does it taste? Here’s a quick rundown of all the flavors you get as part of the Suja Juice cleanse so you know what to expect. Probiotic Lemon Cayenne Water Apple Cide Vinegar Juice – This one is definitely the biggest mouthful to say but is a really different addition that not many other juice cleanses have. Quite spicy with the cayenne and ginger too plus apple cider vinegar but they all combine to make a really great juice for your gut. Mighty Dozen – This is a green juice packed full of goodness, you’ve got apple, celery, cucumber, Kale, collard greens, spinach, mint tea plus some other goodies to have you packed full of energy and feeling fantastic. Trim Greens – This is cucumber, celery, lemon, lime, kale, dandelion, collard greens, lettuce and again mint tea. I like that there isn’t any fruit in this one, it means it’s not the easiest to drink if you’re unused to just vegetable juices but it’s really good for you packed full of vitamins and minerals. Fuel – Carrot, orange, apple, pineapple, lemon and turmeric. A really sweet and spicy juice that can be a nice treat at the end of the day. Uber Greens – Cucumber, celery, grapefruit, green chard, green leaf lettuce, lemon, kale, spinach, mint tea and parsley. Lots of Vitamin C to help keep your immune system strong and also helps protect your skin from UV rays. Brilliate Beets – Carrot, cucumber, beets, pineapple, lemon, ginger, corn silk tea. Beet juice is great because it can work to increase the amount of oxygen in your body which can make you feel more awake and have you more alert and energised. Berry Protein – Apple, strawberry, banana, almond milk, pea protein, chia seed, vanilla. A little thicker and more of a smoothie with a nice boost of protein to keep your energy levels high and your metabolism working strong while you do your cleanse. Overall, a really nice collection of drinks that will keep your cleanse interesting and your body happy. Every upside has its downside, right? No review is complete without a pros and cons section! Large variety of Flavors – I’ve gone into them all above but I really like that you get a large range of flavours as drinking a single flavour of juice over and over for 3 days is not a good time. 7 Bottles A Day – Which means you can have a fairly steady stream to see you through and the day and out the other side. This helps with hunger because you’re getting sustenance all day long, less than normal of course but it definitely helps. Cleansing breakfast – I love breakfast as I said earlier too so this is great I think, a nice healthy breakfast to set you up and see you off for the day. Not The Best Tasting – It is very low on sugar but as a result it does not taste the best, raw generation for instance have a great tasting juice cleanse because the base of all of them is apple juice, and sugar from fruit is packed with all the nutrition of fruit so is a lot healthier than refined sugar. 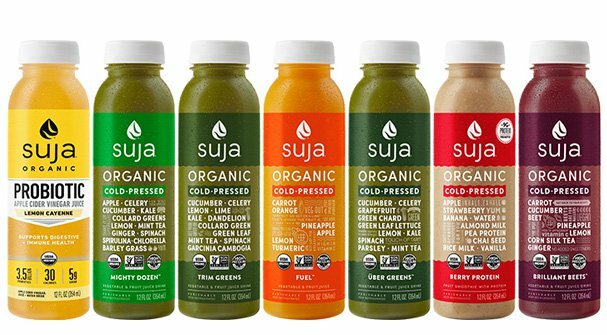 HPP packaged – Suja juice is bottled through HPP which is high-pressure-processing that works to pack the bottles without the need for preservatives. So it’s still raw and natural but the HPP process is thought to cause some nutrition loss and the loss of living enzymes that are inside freshly prepared juice. So I’m not mad about it but I don’t love that they use this method, I prefer flash freezing because it means the nutrition is there and the bottles last 6 months in the freezer. 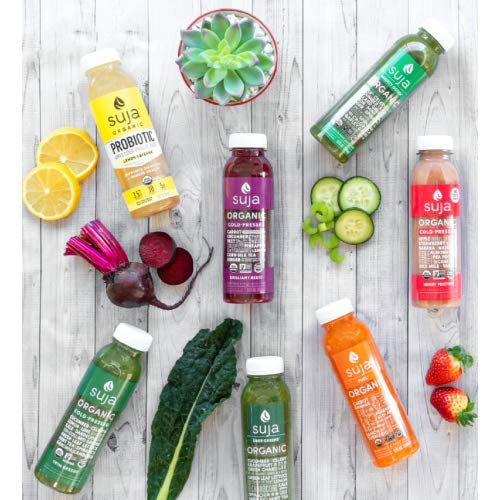 The Suja juice cleanse is a great, varied juice cleanse, perfect for beginners who will love being able to have breakfast and anyone looking for a solid 3 day cleanse that is low in sugar.